Opponents of the Keystone XL pipeline have long warned of the catastrophic impacts of a major spill if the infrastructure were to fail. On Friday, the nation no longer had to imagine how a tar sands disaster would look. The city of Mayflower, Arkansas was inundated with thousands of gallons of black diluted bitumen leaking from the ExxonMobil Pegasus pipeline, forcing the evacuation of 22 homes. Classified as a “major spill” by the EPA, fifteen vacuum trucks and 33 storage trucks have been deployed to contain the oil and keep it from spreading into local water bodies. The failure once again highlights the inherent danger in transporting tar sands oil, and adds to the pressure facing President Obama in his decision whether or not to approve the controversial Keystone XL Pipeline. In recent months, the president has had to consider a State Department report whose author had ties to TransCanada, nation-wide political demonstrations, and now a major environmental disaster. Last week, between 80,000 and 420,000 gallons of tar sands-diluted bitumen leaked into the suburban neighborhood of Mayflower, Arkansas from ExxonMobil’s Pegasus pipeline. Much more difficult to clean than conventional crude, the rupture demonstrated the risks of transporting tar sands across the continent. Bitumen pipelines operate at much higher temperatures, increasing the risk of bursting from external corrosion and error by 23 times according to the NRDC. Running at only one tenth of the capacity slated for the Keystone XL pipeline, the Pegasus offers a small and tragic sample of what could occur. Cleanup efforts in Arkansas have begun, but the EPA is still struggling to contain a 2010 Enbridge spill into the Kalamazoo River near Marshall, Michigan. Heavy rain had caused oil to travel 35 miles downstream before it could be contained. In March of this year, the EPA required the Canadian company to dredge sections of the waterway, calling to attention the massive amount of time and effort needed to fix one mistake. 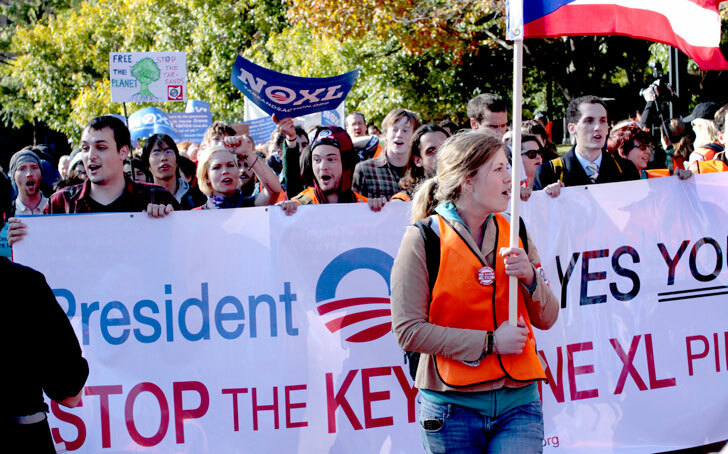 On Sunday, the top Democrat on the House Natural Resources Committee, Ed Markey of Massachusetts expressed renewed concerns over the Keystone proposal. He called on the IRS to close a tax loophole that allow oil companies to forgo paying money into a tar sands oil clean up fund. “Whether it’s the proposed Keystone XL pipeline, or this mess in Arkansas, Americans are realizing that transporting large amounts of this corrosive and polluting fuel is a bad deal for American taxpayers and for our environment. Tar sands oil is already the dirtiest, riskiest oil around, and should not be getting a free ride across America. It’s time that we recognize the real effects producing and burning this oil will have on our climate, and the real world damage it can cause when it is spilled in our neighborhoods,” Markey said. On March 14, the Senate passed bipartisan legislation that would allow Congress to approve the Keystone XL pipeline instead of the president. The bill was co-authored by Republican Senator Mark Pryor, John Hoeven, a North Dakota Republican, and Montana Democrat Max Baucus. “The route has been approved and the studies have been completed. The President has been sitting on this valuable opportunity for far too long. Our bill gives Congress the authority it needs to move forward with this vital project and create jobs here at home,” said Pryor. The Senator has yet to comment on the Mayflower spill or reports claiming that the Keystone XL would only provide as few as 20 permanent jobs. With tar sands pipelines having dumped 3.6 times as much crude oil per pipeline mile since the nineties and waterways still suffering from the effects of pollution, can we truly afford to continue moving such dangerous material? Opponents of the Keystone XL pipeline have long warned of the catastrophic impacts of a major spill if the infrastructure were to fail. On Friday, the nation no longer had to imagine how a tar sands disaster would look. 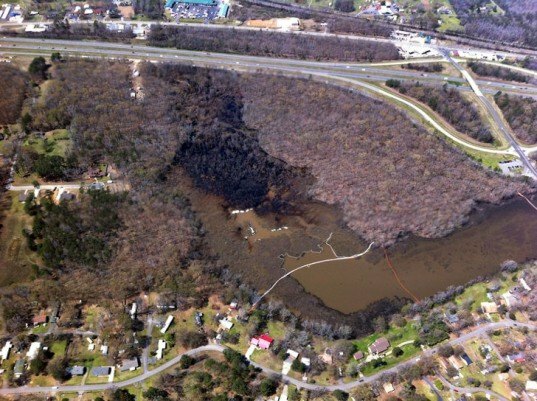 The city of Mayflower, Arkansas was inundated with thousands of gallons of black diluted bitumen leaking from the ExxonMobil Pegasus pipeline, forcing the evacuation of 22 homes. Classified as a "major spill" by the EPA, fifteen vacuum trucks and 33 storage trucks have been deployed to contain the oil and keep it from spreading into local water bodies. The failure once again highlights the inherent danger in transporting tar sands oil, and adds to the pressure facing President Obama in his decision whether or not to approve the controversial Keystone XL Pipeline.